We have identified a set of questions relating to indigenous data governance, ownership and access, along with potential solutions for benefit sharing and value generation. What are the key challenges to realising indigenous data sovereignty and how might they be addressed? What are the key mechanisms needed to realise indigenous data sovereignty at global, national and local scales? What is the transformative potential of indigenous data sovereignty for Māori? What can we learn from ‘best practice’ examples of indigenous data sovereignty that already exist? 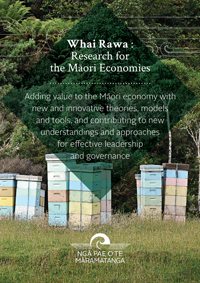 What do alternative models to tribal corporations look like for iwi and hapū development? A wealth of historical narratives provide alternative examples of successful tribal economic development and management practices that have existed in the past. However, the last two decades have seen the emergence of a commercially successful corporate-beneficiary model in which the majority of Treaty of Waitangi settlement assets have become centralised within corporate structures. In 2004 Dr Kepa Morgan embarked on a pilot project based around an idea of combining rammed earth technology with muka (flax fibre) – effectively integrating mātauranga Māori with science and engineering, to create low-cost housing solutions. The result was whareuku.